Prediction of the ground thaw formations around a kilometer-long section of a relatively long gas pipeline was implemented for the first time on a model discretized in 58 million nodes in the newest version of Frost 3D Universal software. 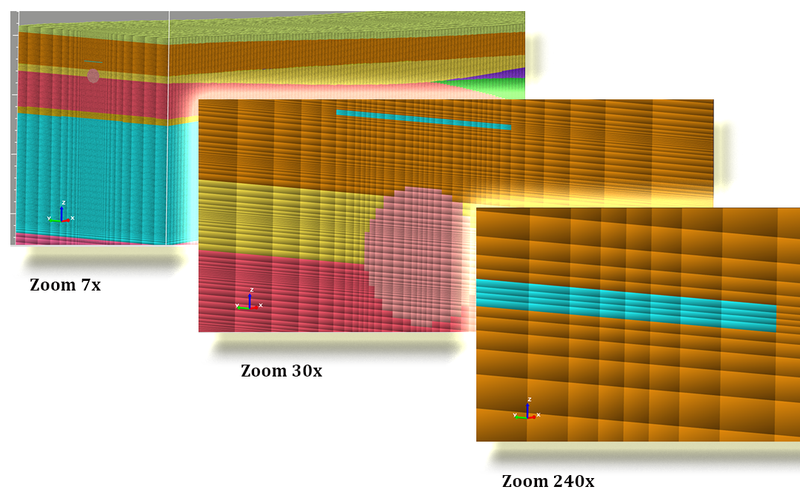 Simulations of the ground thaw formations around the gas pipeline were performed for a 2-year period. For the computations, a PC with a quad-core CPU and 24 GB of RAM was used. The computation in Frost 3D Universal software was completed within 68 hours. The approximate computation time of the given model using the Tesla К40 video accelerator is 8 hours. Older versions of Frost 3D software were able to discretize such models into a maximum of 22.3 million nodes, which was insufficient to accurately account for small elements such as thermosyphons and heat insulation materials. Simulation of ground thaw for a 20-year period for the pipeline model discretized into 22.3 million nodes was completed within 7 hours on the NVIDIA Titan graphics accelerator. A range of innovative technologies was implemented in the new version of Frost 3D Universal software to raise the performance bar to new levels.